March 4, 2016 ~ Going to Smith Oaks Rookery at High Island, Texas is one of the highlights of Spring Migration. The world-famous nesting site attracts avid birders from all over. The viewing platforms get quite crowded, especially on the weekends with binocular birders and photographers vying for space. This is my fourth year to photograph the wonderful nesting birds. Last year we went on March 3rd and again on March 17th and 18th. This year has been a bit of an anomaly with such a mild winter and early spring, so we took a chance and went much earlier, on Feb 21-22nd. There was plenty of activity and none of the trees on Heron Island have leafed out to obscure the view of the birds. The second day we were there, it was deserted. Just me, Bill Maroldo and the birds. The High Island Sanctuary and its four sites officially open March 15 but the birds don't read calendars. And I am so glad. Is that not that the most joyous bird you have ever seen? I am using this for my screensaver. Let's just enjoy the birds and talk photography techniques in this adventure. If you don't care about cameras and settings, just scroll down and look at the photos, I won't mind. The days we chose to go to the rookery were overcast, in fact we had a bit of rain on the second day. We purposely tried to time our efforts there to the weather. Of course, the meteorologist are often wrong (and a forecast ONLY a model) but bright, sunny days are going to yield much different results and less desirable photos, IMO. Bright sun is going to produce harsh shadows from the bird's body and the surrounding trees. OK. Here is a Google map of the island where the birds nest. North is at the top of the map. Some folks like to get there at sunrise, but the strong backlighting can be tricky to handle. Early morning you will be shooting into the sun. IMO there isn't much reason to get there at dawn. You can't stake out a good spot on the viewing platform because you are supposed to move your tripod after 30 minutes to let someone else in the front. Late afternoon when the sun is lower and behind you is a better strategy if you have to go on a sunny day. And check the wind direction. A southern wind is ideal as the birds flying back with their stick offerings (or later, with food for the chicks) will be facing a headwind and be slower ... much easier to photograph. In fact, weekends are going to be really crowded. Take a vacation day and go in the middle of the week, you won't regret it. The Great Egrets in this photo have a dreamy, ethereal look that would be totally lost if each of those branches cast a dark shadow on the white birds. High contrast light will produce sharp-edged, dark shadows and low contrast light will yield soft or non-existent shadows. We were thrilled with the light on this trip; it is always chancy but this time we were fortunate. So now that we have discussed the light, what about cameras? You can have a wonderful time taking snap shots with your point-and-shoot and watching the birds with binoculars. But to get good closeups of the birds and nesting efforts (and chicks later in the season) you are going to need some serious glass. A crop sensor camera with at least a 400 mm lens will give you an effective focal length of close to 600 mm depending on the brand. If you have a full frame camera, you focal length is the same as the attached lens. The first year I went in 2013 I had my Panasonic FZ200 (a older model bridge camera) and I was able to zoom in pretty well. Of course with a camera like that you can't successfully crop or enlarge any of your photos. Last year I used my Sony A77II with the Sony 70-400 G2 lens and was pretty happy with the 600 mm focal length. This year I used my Sony A77II with Bill's Sony f/4 500 G lens. I had to remove the telecoverter (1050 mm is just too much) and so most of these photos are shot with an effective focal length of 750 mm. Birds in flight are a real challenge with a tripod-mounted rig, but I am determined to improve my skills since there is no way I can hand-hold the Big Boy lens for more than a few shots. All this means since the birds are about 75 feet from the viewing platforms and in constant movement, you will need something with good focusing ability and some reach. A 300 mm lens is not going to give you great photos. Other residents at the Rookery at this time are the Roseate Spoonbills. 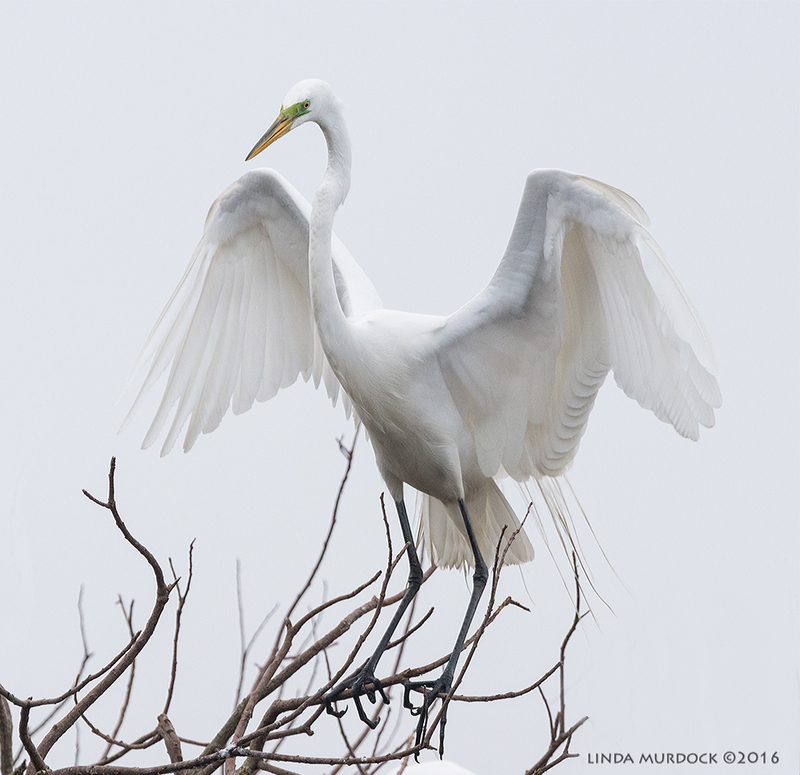 They are not nesting now and are much fewer in numbers than the Great Egrets. When we were there I think I counted about eight in the area in front of our platform. They were noticing each other, and doing their pre-courtship bobbing in unison while balancing on a limb activity. This youngster (still pale and fuzzy on the head and neck) had been walking around under the trees and then flew up to the very top of a busy tree full of nests. When the Great Egret with the stick attempted to land behind him, he quickly vacated the area. This year some of the Neotropic Cormorants have built nests among the Great Egrets. It is a mystery how they work out these territorial claims, but it looks like they have moved into the high rent district. Last year most of them were down in the willows at the end of the island. Cormorants are a huge challenge for me. One, they fly like the wind, really fast and are difficult for me to follow even hand-held with the 70-400 G2 combo. Two, since they are dark birds, you have to remember to drop your shutter speed (or increase your ISO if you can) to avoid the dreaded and fatal sin of underexposure. And you all know, if the photo is underexposed, you will have no detail in the dark areas. It will be just a noisy mess and no amount of post-processing will redeem the image. It made it easier to just change the shutter speed with one dial as needed for the subject. I always shoot manually and really don't know much about other settings such as aperture priority or exposure compensation. This works for me. I do know you are going to need some fast shutter speeds, you are going to be shooting at three colors of birds against a bright sky and/or darker foliage backgrounds. And the birds will fly past you at almost eye level and sometimes really close. I tend to shoot a series on an activity (say interactions between spoonbills) and then find another subject, unless some wild and raucous noise gets my attention. Or I notice a bird is coming in from a long distance - he probably has a stick and that will be good to follow. It can be really overwhelming since there is so much going on. You will be tempted to shoot whatever catches your eye and forget to adjust the settings for the bird and location. Shoot egrets for a while, then change you shutter speed and concentrate on the darker cormorants or spoonbills. It is hard to remember to quickly adjust your settings and you will get distracted by some loud noises and all the other photographer's rapid clicking. Try to remember you and the birds are going to be there all day and there will be more opportunities for action than you are generally used to. The Rookery is the perfect place to practice your BIF techniques. Birds are constantly taking off and arriving. Sometimes they circle around and you can get a bead on one coming in for a landing. If you see one coming in with a stick you can often follow him to his mate and get the presentation. The birds always look so happy to see each other! I know I am anthropomorphizing, but they greet each other with all these open bill squawks. It is absolutely amazing (and don't you love being amazed by something at this stage of life?) to think that these birds are finding mates, courting and nesting in colonies with other birds not a foot away to raise up some successful chicks. All this high-intensity activity for about two months and then... the rest of the year they are solitary individuals and rarely tolerate another Great Egret anywhere near them. And a few more basic tips. A tripod is nice and a necessity if you have a heavier, longer lens. But if you are comfortable hand-holding, you will have a lot more freedom of movement. Take plenty of charged batteries. And extra flash cards. You will take a lot more photos than you expect. You can pack your laptop and go to the car and transfer the images to free up a card for more photos. I took 3,439 photos over two days. I have more to show you next week when I want to talk about some interesting behavior in the Great Egrets. And don't forget the mosquito repellent. They are already bad this year and will surely get worse. Have you ever been to High Island? Have you tried shooting birds on overcast days? Do you stay home on cloudy days because someone told you that you couldn't get good photos unless it was sunny? Let me know in the comments below.